January felt really long, dontcha think? I don’t expect it to continue. I have read exactly two books in January. Firstly, Idiopathy (Sam Byers) which was January’s book club book. It was a perfectly entertaining read that took very little time, but which is not going to stay with me (I know this, because I keep forgetting one of the lead characters’ names…). It’s not as clever or satirical as it thinks it is. I also read Vera Brittain’s Testament of Youth, which was a bonus book club book, to go with the film that recently came out. It was a pretty tough book to read, because the style demands your attention, but also, ultimately, a suprising treat that was much richer than I would have predicted, or than the film would let on. I’ve declared cinematic bankruptcy once already this year, and I’m going to have to do it again in February I think. I know it’s Oscar season, but - despite the usual harrumphing at the Oscar nominations - it feels like the release of stuff that I want to see is more of a deluge than usual. I’ve already missed both Whiplash and Wild, and I think I’m about to miss A Most Violent Year because there just aren’t enough evenings in the week. I particularly enjoyed Ex Machina, of which more later this week, and Birdman. I often find Alejandro Gonzalez Inarritu overly pretentious and faux-deep (coughBabeland21Gramscough), but Birdman has enough surreality and weird humour to offset the pretension and bring in more depth than the story might otherwise achieve. The ‘one-take’ effect is distracting, as is the actual quality of the footage at times, especially in scenes with Emma Stone and Ed Norton on the roof. But then, equally distracting on the positive side is the presence of Edward Norton smashing a dramatic role out of the park, something that always makes me happy. 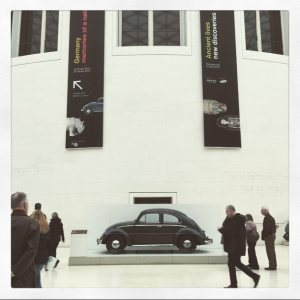 The Great Court of The British Museum: home to a VW Beetle for the duration of the utterly fascinating Germany: Memories of a Nation exhibition. I’ve finally got back to Don DeLillo’s Underworld, which I was really enjoying, so I’m looking forward to finishing that off, and then it’s onto Zia Hader Rahman’s In Light of What we Know for book club. Big Hero 6, Inherent Vice, Blackhat, Focus, Jupiter Ascending and Selma are all on the cinema list, somewhere in between seeing Onegin at the ballet, and the Staves and the Decemberists in concert. Glad those books I’m reading are short and all.